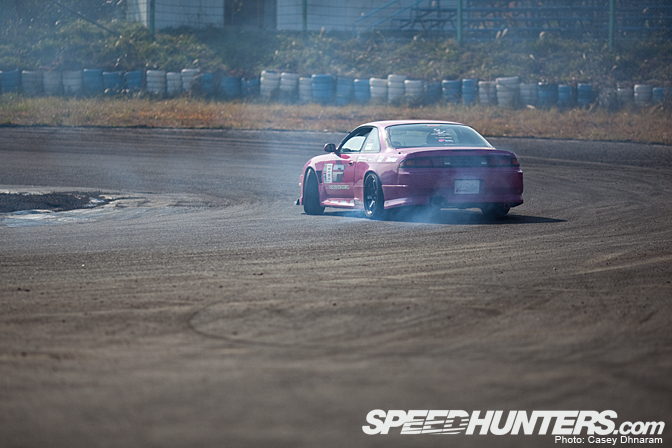 The gaijin drift 2010 G1GP season ended last friday November 12th with 3 round on Ebisu’s nishi short drift course. By far this last event was the biggest and best display of cars and drivers since G1 started exactly this time last year on the very same course. Roughly 45 drivers in total entered to compete in this final round – quite less than the anticipated 72 which the event organizers Team Orange weren’t not too pleased about. Still, 45 world class drivers came out to have fun and battle for the 1st place trophy in the best place on earth! Who’s this? None other than yours truly! Disco Stu. Dino always seems to catch me putting on stickers. I came in 13th place overall. You can watch some onboard footage of me from the day here. Andy from PowerVehicles.com played a big part in organizing he event and supplying cars for a lot of the drivers. 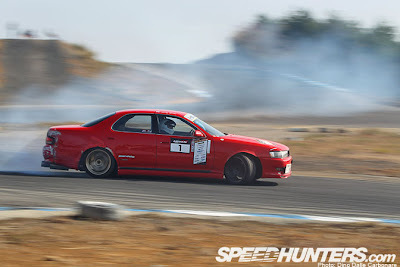 Here he is in his workhorse JZX90 looking a little worse for wear but still pumping out crazy smoke. Chris Dejager was in fine form all day in his trusty S14 silvia. One of the prettiest cars on the track is Emily from PowerVehicles.com ‘s pink S14 kouki! Emily came in 16th place on the day. Emily also enters the ladies D1 venus series in this car. John Dreyer was out again in his police spec R32 skyline. 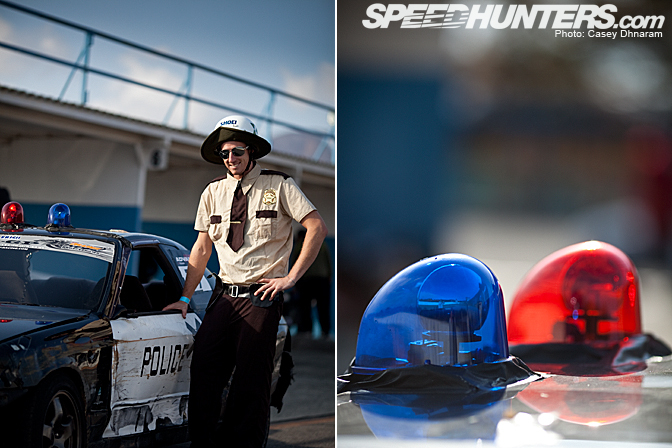 Looks like he has been in one too many high-speed chases that didn’t end so well. 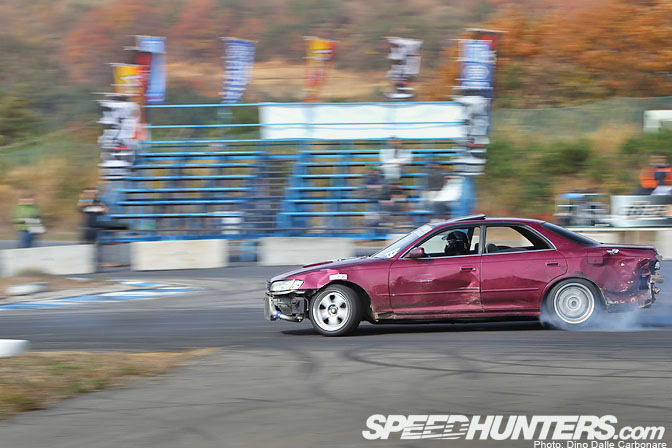 Another Aussie who came back for more is Leigh Pidwell and his purple/maroon JZX 90. Leigh finsihed in 4th place after knocking out Andy Gray in the top 8 battle. 2 french waiters escaped from the restaurant to come check out the action. Just kidding. JC on the right was out in his newly acquired and very clean S14 silvia. He placed 3rd in the novice class. Daigo Saito showed up carrying this V8 powered 240SX that he purchased from the United States. Love the growl of the V8 sound. He did a few practice laps with one group of gaijins. Because of the large number of drivers, they split up the competition into PRO and NOVICE class. These are the top 6 from the novice class. My mate Dave Lawrie from JPP on the gold coast just scraped in in 6th place (far left). Great effort from Chris Dejager who walked away winner of round 3 and overall G1GP 2010 points champion! His prizes for winning the 2010 series included: A custom embroidered BRIDE bucket seat and a D1GP license handed to him by Mana P!! Congrats Chris! The final results from the PRO class. Good to see a mix from more countries than just AUS! A big thanks to Team Orange, Powervehicles, Speedhunters, Zenky Racing, all the drivers and other participants for making this the best round of G1 yet! Looking forward to what 2011 will bring! Hopefully will see you there too!